Today’s post is about the Waffle House Index & Postcards. With watching the weather channel predictions of Hurricane Florence being a Category 4, even possibly a Category 5 approaching Wilmington, it is worth noting about the Waffle House Index. “After the devastating 2011 Joplin, Missouri tornado, Fugate came up with what is termed the “Waffle House Index,” which has three color-coded levels tied to the extent of operations and service at the local Waffle House location after a storm. “Green” is based on the location serving its full menu, indicating the location has full power and limited damage. “Yellow” is based on the location serving a limited menu, which means there may be limited power from a generator, or no power; or there may be low supplies of food. Within that last link, it includes the following which I’m including here. 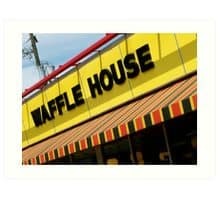 The Waffle House Postcard showing is for $2.29 at Redbubble; it is of a Waffle House in Atlanta, Georgia. There are several options showing available at Redbubble; have fun exploring. Here’s to being careful and continuing to do storm preparations! P.S. Our countdown to #1,300 continues; today is daily blog post #1,293 celebrating letter writing! You may also enjoy AnchoredScraps daily blog post: Preparedness and Mobile Letter Writing Kit, October 05, 2017, by Helen Rittersporn.